The Piedras Blancas Lighthouse is an easily accessible ninteenth century lightstation at the southern end of Big Sur. Near Cambria, Hearst Castle and the elephant seal colony, it offers tours and is in the process of being restored to its former glory. The photo to the right shows the lighthouse as it appeared before an off-shore earthquake on Dec. 31, 1948 damaged the lantern room. The lens and lantern room were removed and the tower capped off, which is how it remains today. In 2001 the light station was transferred from the administration of the Coast Guard to the Bureau of Land Management. The BLM has undertaken a program to stabilize and renovate the light. 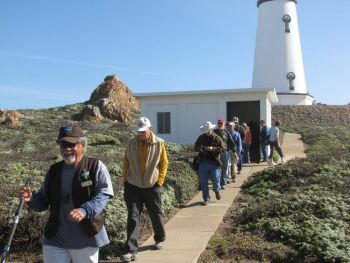 The Piedras Blancas Light Station Association was formed in 2004 to assist with this goal. 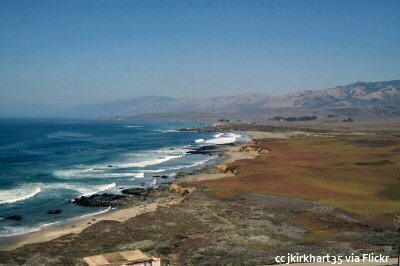 This photo is a view to the north taken from the top of the lighthouse and shows the beginning of the Big Sur coast. The broad coastal benches end here with the mountains nearly plunging right down to the sea. If you compare the photo to the right (taken around 2008) with the photo at the top of this page and the one directly below here, you can see that the recent, color photo shows the lighthouse tower to be dingy and stained. However, an extensive paint job has just been completed on the tower so that it once again appears in its brilliant white covering. 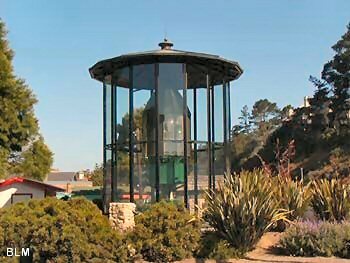 Public tours of the Piedras Blancas Light Station are offered September 1 through June 14 on Tuesday, Thursday, and Saturday at 10 a.m.
From June 15 through August 31 tours are offered Monday - Saturday at 10 am. There are no tours on federal holidays. 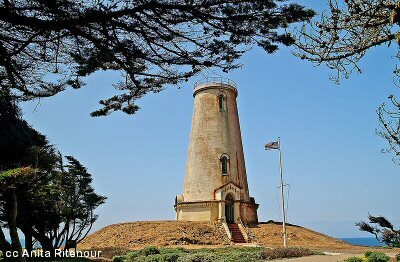 Tours last 2 hours and include the historic lighthouse, support buildings, wildlife viewing and spectacular scenery along an easy ½ mile interpretive trail. Wear comfortable walking shoes and dress warmly. No pets! Meet at the former Piedras Blancas Motel (GPS coordinates: 35.68836, -121.28826), located 1.5 miles north of the light station at 9:45 AM. Do not wait at the gate to the lighthouse! The price is $10 for adults, $5 for ages 6 -17, no fee for children 5 and under. Tours may be cancelled due to inclement weather. In addition to these regular tours, there are specially themed tours offered throughout the year. There are twilight tours, which is especially nice seeing the light shining at night. There are also whale watching tours offered when the gray whales migrate up and down the coast. The whales generally stay close (within a mile or two) of the coast and the point offers good vantage points. You can check with the BLM page listed above. Or, you can keep informed on my Facebook page for Discover Central California at this address. I often post happenings and events that don't make it onto the pages here. 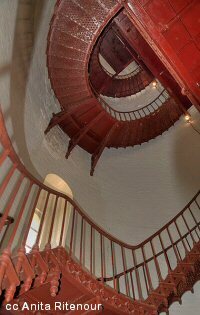 A view of the interior of the lighthouse showing the cast iron stairs after some renovation and painting. One of the fascinating things to see in any historic building is the attention to detail that was put into simple items. That is certainly evident here. 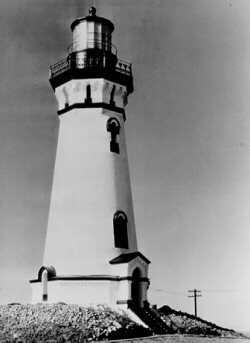 After the 1948 earthquake, the first-order fresnel lens was removed. It was refurbished and has ended up just down the road in Cambria where it can be found at 870 Main Street at the Lion's Club grounds. 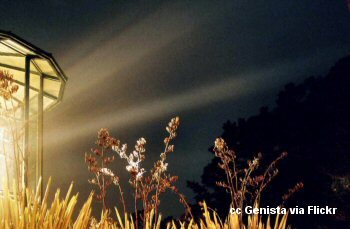 The photo below shows the great display of the fresnel lens. It's difficult to gauge just how big it is since there is nothing in the shot that allows comparison. However, the glass shelter in which the lens is now housed is approximately 20 feet tall. That makes the lens and the original mechanism below it about 18 feet tall. It's really quite big and impressive. Stop by when you're in Cambria. It's an interesting thing to see.